On August 13, 1955, an F-89 Scorpion jet crashed 1,500 feet short of the runway at Otis Air Force Base as it was attempting to land. The radar observer, 1st Lt. Donald L. Reilly, 26, of Morton, Illinois, was killed instantly. The Pilot, Captain Lawrence G. Reichert, 30, died later at the base hospital. 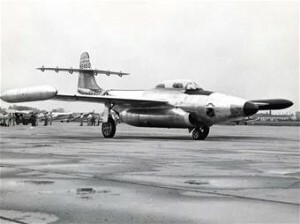 The aircraft was attached to the 58th Fighter Interceptor Squadron at Otis. Source: Falmouth Enterprise, “Fliers Killed In Crash Of Fighter”, August 19, 1955.